Anyways, who will be the next Canadian to play home games at Fenway Park? We have a lack of first base prospects, so maybe the Reds will look for some salary relief in a few years and we'll get Joey Votto? Probably just wishful thinking. We have lots of catching depth in the minors, but if there's a major injury to AJP or Ross, we may need a shorterm gap. Would a return by George Kottaras be possible? What about backup infielders? 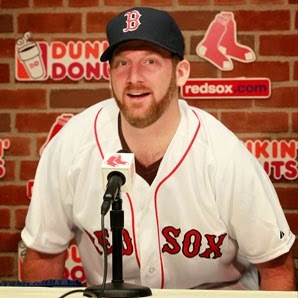 We need someone who can play 2B if Pedroia is out for a while. Pete Orr could be available. (Side note: A friend once asked me if I knew why Orr wore uniform #4. I had no idea. I was given a hint that it involved a Boston athlete. Since he played some third base, I figured maybe he was a Butch Hobson fan growing up? Apparently he shares a last name with some other dude who became famous in Boston wearing #4. Who knew?). Anyhow, none of the above sound too likely. Down on the farm we have Vancouver's Keaton Briscoe, who played mainly third base at Greenville last season. I believe he is the only Canadian (player) in the organization at the moment. He was signed by Canadian Red Sox scout Chris Pritchett after the 2012 June draft. So, who do YOU think will be the next Canadian on the Red Sox roster? Leave your guesses in the comments below. More local news, Calgary's own lieutenant-governor of Red Sox Nation, Marc David, is hosting another RSN Watch Party. It's on Saturday April 12th when we take on the Yankees. With the Melrose Red Mile shutting down, it's been moved to a new venue, Schank's South on MacLeod. All the details on the watch parties page. And finally, yours truly, will be back at Fenway Park for Opening Day. If you're there look for me, if you're watching from the comfort of your living room, let me know if you see me on your screen. I'll be the guy wearing a Red Sox jersey and a hat with a big red B on it. Should be easy to spot (! ).